I'm here, I'm here, I didn't go anywhere! I had this crazy week and was almost sick from the exhaustion. I spent more hours sleeping this weekend, so I hope things will get back on track on here. Lats week was such a bad week for science blogging, I know! Even had to skip the weekly Friday Bloggers series (this time only, promise! ), but together we will have a fantastic one this week, ok? All these aside, what you can see above is yesterday's outfit. I am wearing a seriously amazing, warm poncho. In fact, I'm not sure whether I should call it a poncho or not, because it has some tiny sleeves, which make it easier to wear. Paired with crazy print tights, sky-high heels and a default summer dress. I love your print tights, they are fab! I need a poncho, it's freaking cold (by Mexican standards) here and I've resorted to layers and layers of thermal (and not glamorous) clothes. Hope you have a great week Daiane :DD. cute outfit, those tights are great! and the shoes are perf for fall! 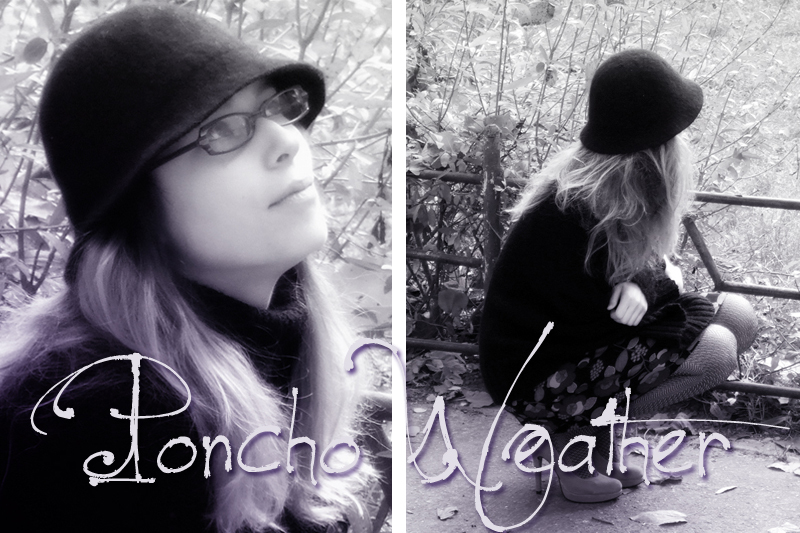 I absolutely love the poncho!! Esp with that hat and those tights and nudie looking shoes!! I hope you got enough rest hun!! I love the tights and shoes! The shoes with those things - so freaking perfect! Do you sign your posts?